The Campbell is not just another elegant key chain – it's contemporary design allows the key chain to be used as a mobile phone stand and bottle opener. 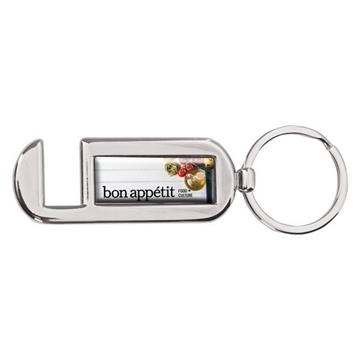 This handsome key chain is available in a high gloss polish with a standard 1 ½" split ring. 24 Hour Rush must be 1-color / 1 location only. I loved the creativity of the product. The children and adults loved them! Thank you! It was better than I expected especially from the picture on your website. We liked that it was good shaped. You need to add some other product offerings to your catalog. We ordered these for our lodging properties. It's a quality product and I'm going to order more right now. Worked very well for the price! there is nothing we liked "least" about either product!